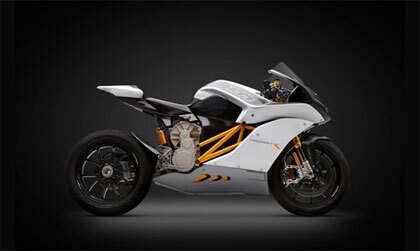 He just debuted the fastest street legal electric bike in the world. Meet Mark Seeger, InsideHook’s Man of the Month for June. He’s thirty-three years old and six-foot-six. He’s incredibly upbeat. He’s unfailingly polite. It’s called the Mission RS. Horsepower: try 160 of ’em. Top city range: about 220 miles. Emissions? None. And it does zero-to-sixty in three seconds. That’ll flap your cheeks, fella. To hear Seeger tell it, the main reason he built the Mission RS is because, quite simply, he loves to tinker. And once, many years ago in New Hampshire, he learned an important lesson from his dad. So he started to make things happen. Seeger went to Rensselaer Polytechnic Institute for an advanced engineering degree. He worked with robots. Did some consulting work with Apple and the government. And then, concerned about the environment, he started the biodegradable plastics company Greenidea. Unable to find jeans that fit his 6’6” frame, he launched his own denim brand (M Jeans). Frequent overseas travels led to the creation of TravelMe, a company that sets up travelers with local guides. Frustrated by the lack of R&D in the larger companies he was in contact with, he headed up Ogilvy Innovations, a product and innovation firm. Eventually, his tinkering led back to the beginning. To bikes. Seeger, an avid rider who had moved to San Francisco, couldn’t find an electric bike that satisfied his needs. Seeger studied the market. He tinkered with prototypes. He looked at industry trend lines and saw a point where technology and price would intersect about four years down the road. Satisfied with his research, Mission Motorcycles was born. Four years in, Mission just debuted the RS. So far, forty have been made. And within 72 hours of going on sale last week, half were sold (including two during our interview). So Seeger, by any measure, is a success. And while he jokes about his “tunnel vision” and “impatience” guiding the way, he sincerely credits a can-do philosophy that anyone can embrace. And a few more guys who like to tinker.